- LED Chip : LED double row LED 3528 SMD chip, with the number of LED chip up to 288 chip, but the power is only 18W respectively. Therefore, the type of LED 2-D LEDs are much longer than all LEDs on the market today, due to the density of LEDs => the power per LED chip is very low (0.0625W / a chip). - The lighting industry has spent more than 120 years developing from incandescent bulbs to fluorescent bulbs of all kinds and then for the first simple display leds. In light of the growing trend of technology and towards being friendly and protecting the environment, the advent of LED lighting technology is indeed revolutionizing today's lighting technology. 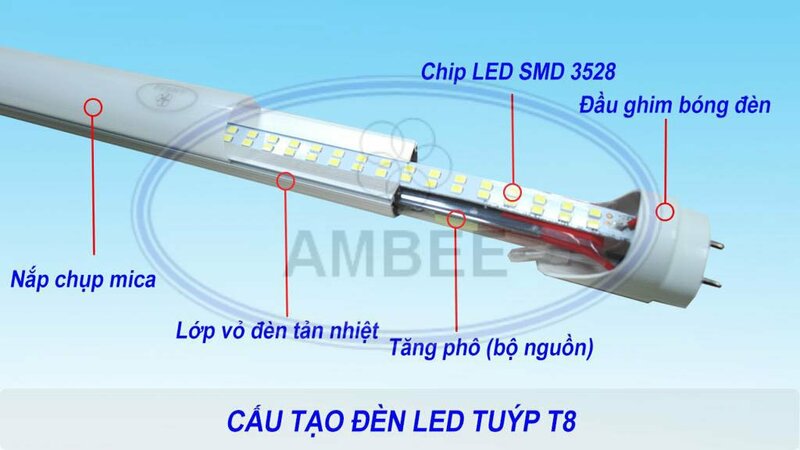 Capturing the latest technology trends in the AMBEE lighting industry, the T8 18W / 1.2m AMBEE LED bulb uses high-performance SMD 3528 chips for high light output and good life. - The third benefit of the AMBEE type LEDs is that it's many times brighter than conventional lamps. The brightness of the lamps makes it possible for households, restaurants, companies, factories to reduce the number of lamps in the past. For example, in my previous home, I had to attach four T10 (40W / shade) twin lights to the guest room. Now, only two 18W LEDs matched each other, with only two lights, but the brightness was the same. 8 old 40W lamp. If used in garment factories or leather shoes, the company can save a lot of electricity and also reduce the amount of light.